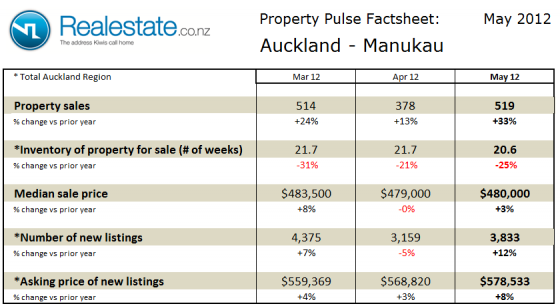 The Auckland – Manukau property pulse factsheet for June 2012 is published using data from Realestate.co.nz and REINZ (Real Estate Institute of NZ). 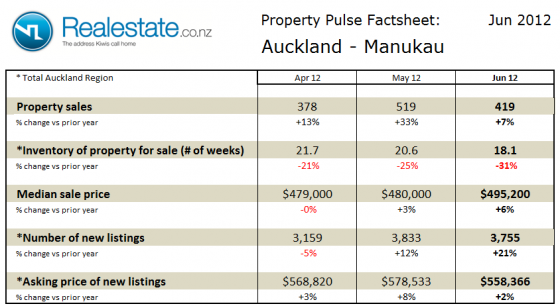 Property sales in the Manukau region of Auckland at 419 in the month fell quite significantly on a seasonally adjusted basis in June although it was still up 7% on June 2011. The inventory of unsold houses across the wider Auckland region at 18.1 weeks remains below the long-term average at 33 weeks of equivalent sales. The median sales at $495,200 was up 6% which represented a strong rise as compared to May at $480,000. The asking price expectation of new listings across the wider Auckland region fell as compared to May to $558,366 but was up 2% as compared to a year ago. 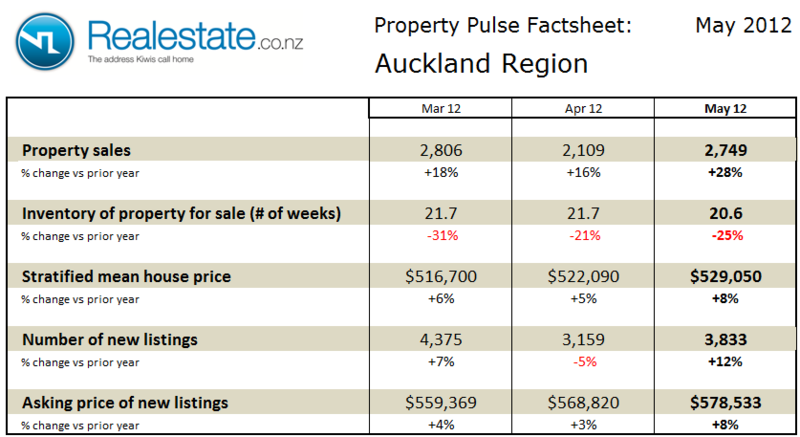 The Auckland region property pulse factsheet for May 2012 is published using data from Realestate.co.nz and REINZ (Real Estate Institute of NZ). 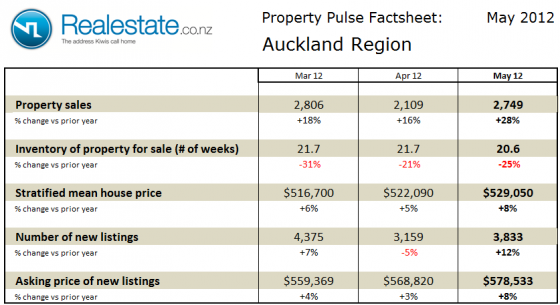 Property sales across the Auckland region at 2,749 in the month rose significantly on a seasonally adjusted basis in May and was up 28% on May2011. The inventory of unsold houses slipped lower again to 20.6 weeks, this inventory continues to track well below the long-term average of 33 weeks of equivalent sales. The stratified median house price at $529,050 rose 8% as compared to a year ago and continues to show the steady growth now over the past 18 months. The asking price expectation of new listings also rose to $578,533 also up 8% as compared to a year ago. The level of new listings coming onto the market across the Auckland region in May at 3,833 was up 12% as compared to a year ago, well below the rate of sales growth. 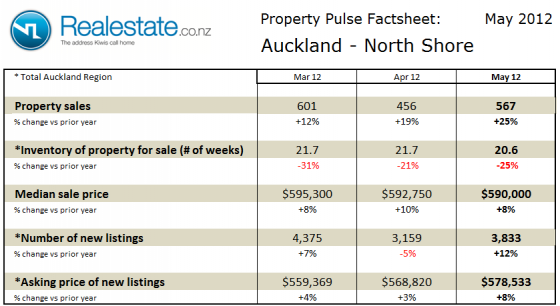 The Auckland North Shore property pulse factsheet for May 2012 is published using data from Realestate.co.nz and REINZ (Real Estate Institute of NZ). 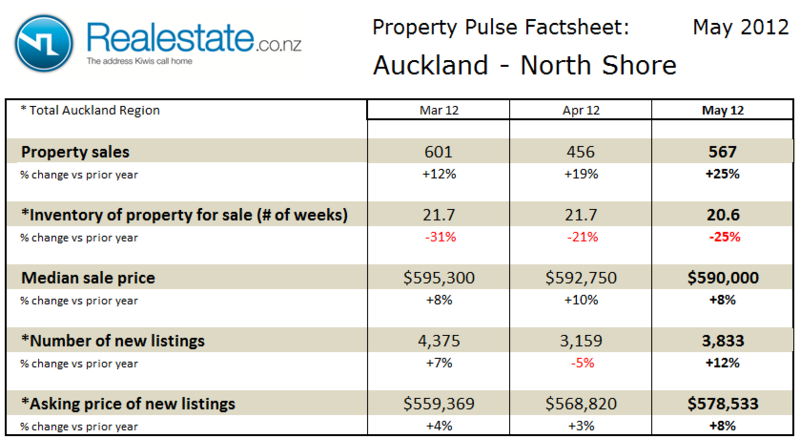 Property sales on the North Shore of Auckland at 567 in the month rose on a seasonally adjusted basis in May and were up 25% on May2011. The inventory of unsold houses across the wider Auckland region at 20.6 weeks remains below the long-term average at 33 weeks of equivalent sales. The median sales price for properties sold on the North Shore in May at $590,000 was up 8% from a year ago. The asking price expectation of new listings across the wider Auckland region also rose to $578,533 up 8% as compared to a year ago. The level of new listings coming onto the market across the wider Auckland region in May at 3,833 was up 12% as compared to a year ago. 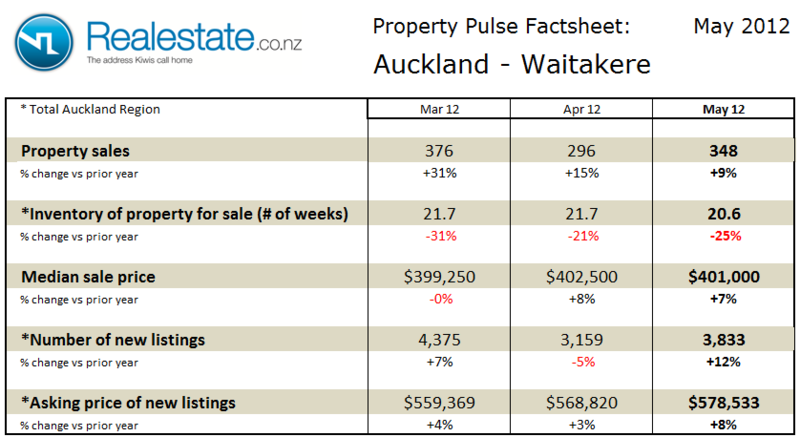 The Auckland – Waitakere property pulse factsheet for May 2012 is published using data from Realestate.co.nz and REINZ (Real Estate Institute of NZ). Property sales in the Waitakere are of Auckland at 348 in the month rose on a seasonally adjusted basis in May and were up 9% on May2011. The inventory of unsold houses across the wider Auckland region at 20.6 weeks remains below the long-term average at 33 weeks of equivalent sales. The median sales price for property in the Waitakere region of Auckland at $401,000 is up 7% as compared to a year ago. The asking price expectation of new listings across the wider Auckland region also rose to $578,533 up 8% as compared to a year ago. 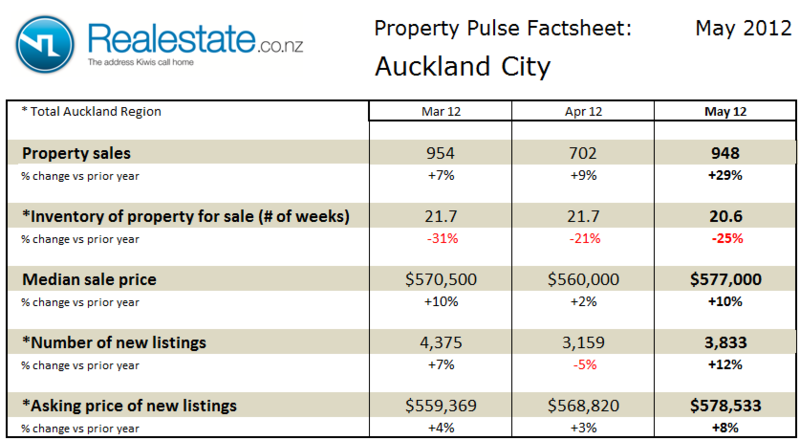 The Auckland City property pulse factsheet for May 2012 is published using data from Realestate.co.nz and REINZ (Real Estate Institute of NZ). 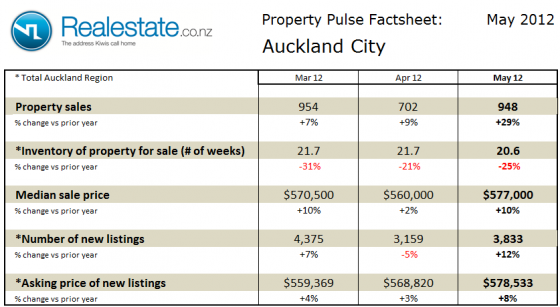 Property sales within the City of Auckland at 948 in the month rose strongly on a seasonally adjusted basis in May and was up 29% on May2011. The inventory of unsold houses across the wider Auckland region at 20.6 weeks remains below the long-term average at 33 weeks of equivalent sales. The median sales price for property in Auckland City at $577,000 was up 10% to reach a new high as compared to a year ago, and was up significantly on prior months. The asking price expectation of new listings across the wider Auckland region also rose to $578,533 up 8% as compared to a year ago. The Auckland – Manukau property pulse factsheet for May 2012 is published using data from Realestate.co.nz and REINZ (Real Estate Institute of NZ). 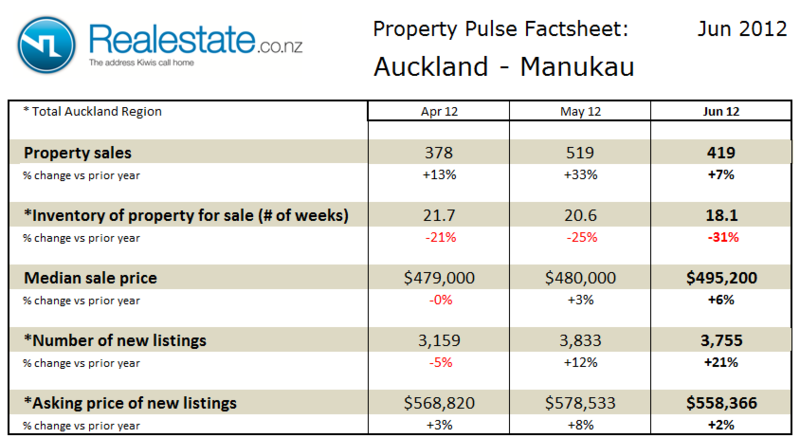 Property sales in the Manukau region of Auckland at 519 in the month rose significantly on a seasonally adjusted basis in May and were up a significant 33% on May2011. The inventory of unsold houses across the wider Auckland region at 20.6 weeks remains below the long-term average at 33 weeks of equivalent sales. The median sales at $480,000 was up 3% as compared to a year ago, recent prices have been fairly flat for the majority of the year-to-date. The asking price expectation of new listings across the wider Auckland region also rose to $578,533 up 8% as compared to a year ago. The Auckland region property pulse factsheet for November 2011 is published using data from Realestate.co.nz and REINZ (Real Estate Institute of NZ). Property sales across the Auckland region at 2,214 in the month rose on a seasonally adjusted basis in November and were up 27% on November 2010. The inventory of unsold houses slipped again to 26.9 weeks, having risen slightly last month to below the long-term average of 33 weeks of equivalent sales. The stratified mean sales price at $510,000 rose 6% as compared to a year ago and fairly stable as it has climbed for the past 10 months. The asking price expectation of new listings also rose to $556,610 up 2% as compared to a year ago. The level of new listings coming onto the market across the Auckland region in November at 4,459 rose 6% as compared to a year ago. 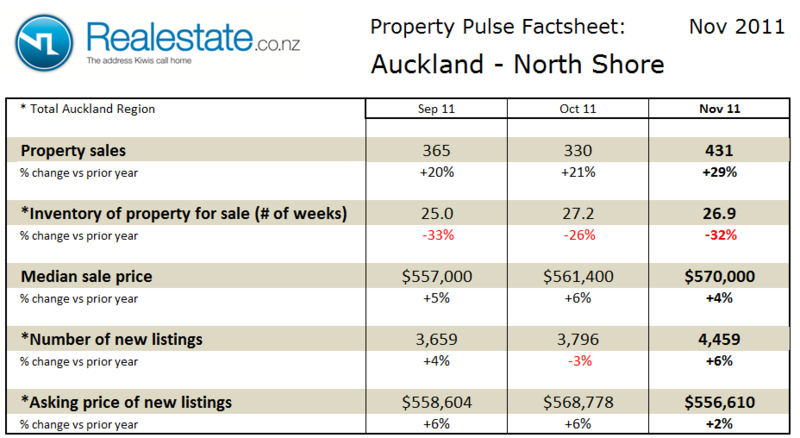 The Auckland North Shore property pulse factsheet for November 2011 is published using data from Realestate.co.nz and REINZ (Real Estate Institute of NZ). 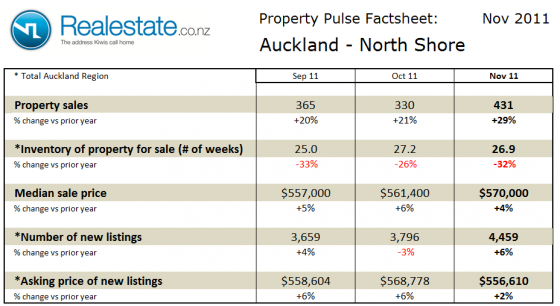 Property sales on the North Shore of Auckland at 431 in the month rose on a seasonally adjusted basis in November and were up 29% on November 2010. 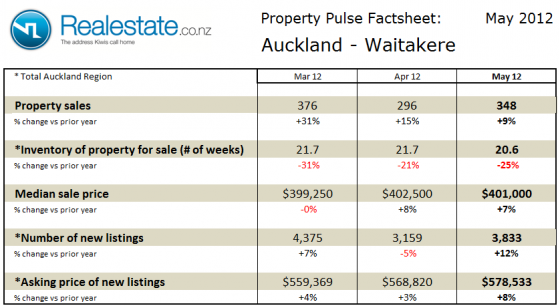 The inventory of unsold houses across the wider Auckland region at 27 weeks remains below the long-term average at 34 weeks of equivalent sales. The median sales price for properties sold on the North Shore in November at $570,000 was up 4% from a year ago and continues to set new highs of the past 3 years. The asking price expectation of new listings across the wider Auckland region remains stable at $556,610 up just 2% as compared to a year ago. The level of new listings coming onto the market across the wider Auckland region in November at 4,459 was up 6% as compared to a year ago. 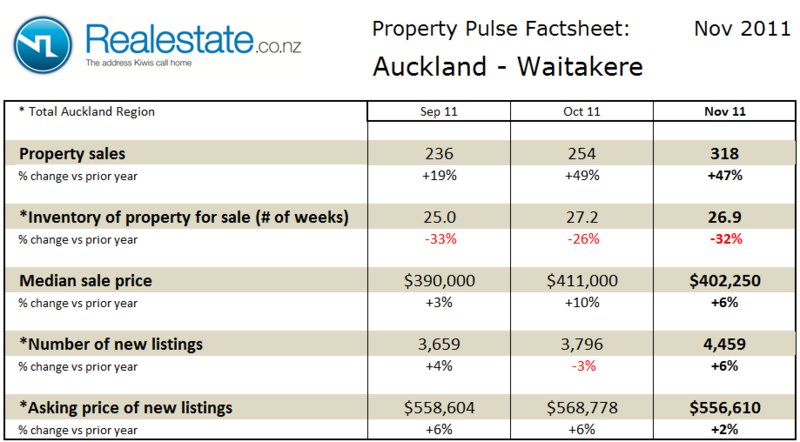 The Auckland – Waitakere property pulse factsheet for November 2011 is published using data from Realestate.co.nz and REINZ (Real Estate Institute of NZ). 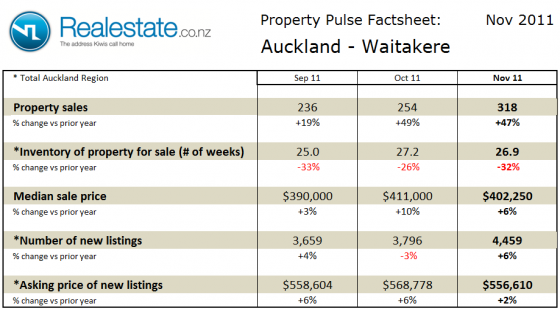 Property sales in the Waitakere are of Auckland at 318 in the month rose on a seasonally adjusted basis in November and were up a very significant 47% on November 2010. The inventory of unsold houses across the wider Auckland region at 27 weeks remains below the long-term average at 34 weeks of equivalent sales. The median sales price for property in the Waitakere region of Auckland at $402,250 is up 6% as compared to a year ago whilst slipping slightly from the new 3-year levels. The asking price expectation of new listings across the wider Auckland region rose to $556,610 up 2% as compared to a year ago, and in-line with recent months. 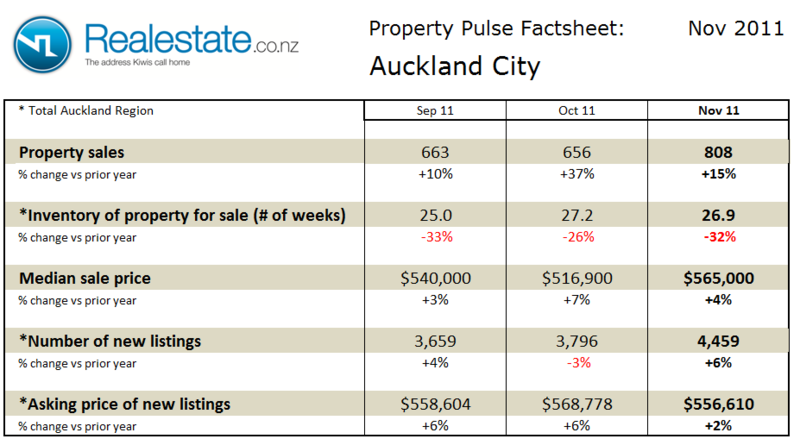 The Auckland City property pulse factsheet for November 2011 is published using data from Realestate.co.nz and REINZ (Real Estate Institute of NZ). 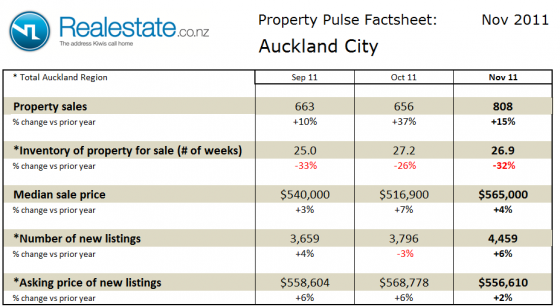 Property sales within the City of Auckland at 808 in the month rose strongly on a seasonally adjusted basis in November and was up 15% on November 2010. The inventory of unsold houses across the wider Auckland region at 27 weeks remains below the long-term average at 34 weeks of equivalent sales. The median sales price for property in Auckland City at $565,000 was up 4% as compared to a year ago, and was up significantly on prior months. The asking price expectation of new listings across the wider Auckland region slipped slightly to $556,610 up 2% as compared to a year ago.